Harry Truman’s defeat of Tom Dewey in the 1948 presidential election denied the small town of Owosso, Michigan a presidential library. In its place is a Tim Horton’s. There’s a Bob Evans for those feeling adventurous. The Ford dealership sends me notices that now is a good time to trade in for a new car. That’s probably about the only change since 1948. Bush 41 took a campaign train ride through the area in the last futile days of his presidency in 1992. His whistle stop campaign tour wasn’t enough to defeat Bill Clinton. Mitt Romney’s biggest opponent, now almost a political slur, is the ghost of Tom Dewey. 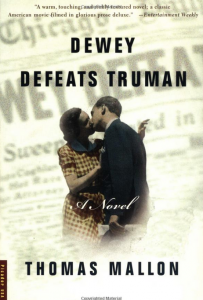 Thomas Mallon’s novel Dewey Defeats Truman, published in 1997, is set in Dewey’s hometown of Owosso. Mallon writes of 1948 Owosso as happy and normal, the quintessential small town America image. Happy and normal could also be used to describe Mitt Romney but the description doesn’t seem to wear as well on him. Mallon’s 1992 American Spectator article Why, O Why, O Why O, Do They Ever Leave Owosso? does note that while Owosso is a good place to raise children, the outside world is gaining influence. Teenage girls are wearing “I love my badass attitude” T-shirts and mom has got on a shirt that says “Cowboys are bad lovers because they think 8 seconds is a good ride.” Take that, Rick Perry. Owosso in 2012 is pretty much how Mallon described it in 1992, and 1948. The town could use a presidential library to at least compete with the Ford library in Grand Rapids. Mallon was in Owosso that year to cover the annual Curwood Festival for the Owosso writer James Curwood (1878-1927). Curwood wrote 33 books and was popular as Zane Grey. Mallon finds a local critic who asks if Curwood was so good, how come no one in Holly heard of him. Curwood’s books had more success in Hollywood than Holly, Michigan, a competitor of Owosso for being the most normal small town in America. Marketers and storytellers hate normal and small. No one wants a story about a hero, or a bottle of shampoo, described as normal and small. Romney’s poll numbers went up when Newt attacked him for working at Bain. Newt’s attack ads changed the image of Mitt Romney from a modern day Tom Dewey into a Michael Douglas from the movie Wall Street. The accusations put some swagger into his image. Through the sniper’s scope I see.